Nick enlisted in the U.S. Navy at 17 and served at various Helicopter Sea Combat Squadrons and the Southwest region’s Fleet Readiness Center during his 13 year tenure. 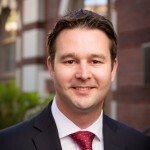 He graduated #1 of 331 with a BSBA in Management and graduated from the University of Southern California’s Marshall School of Business with an MBA in 2015. He is currently working in Finance at Faraday Future and is always very passionate about helping connect veterans and active service members to the education and business opportunities they deserve.